China's GDP Estimates Challenge Policy Makers - Integration Through Media ....! The most serious problem for China’s slowing economy may be that the government doesn’t know how serious it is. For years, some economists have taken China’s official economic data with a large dose of salt, citing government efforts to project stable growth through good times and bad, as well as numerous attempts to stamp out statistical fraud. In the dark days of 2015, for example, China’s National Bureau of Statistics (NBS) reported relatively sunny 6.9-percent growth of gross domestic product, despite evidence to the contrary. Surrogate indicators like rail freight volume fell 11.9 percent, quickening from a 3.9-percent drop a year earlier. Some economists estimated that actual GDP growth slipped as low as three percent to four percent. Critics have paid more attention to the smoothness of last year’s quarterly growth rate declines, starting with 6.8 percent in the first quarter and dipping down gradually to 6.7 percent in the second, 6.5 percent in the third and 6.4 percent in the fourth, settling so slowly and slightly as to raise suspicions of a more serious slump. Faced with mounting challenges at home and abroad, the NBS figures reflect a policy of “maintaining stability,” in the words of its official press release. The actuality may be something less. “China’s economy is slowing, and the slowdown is probably worse than Beijing says,” The New York Times concluded in a Jan. 20 report. 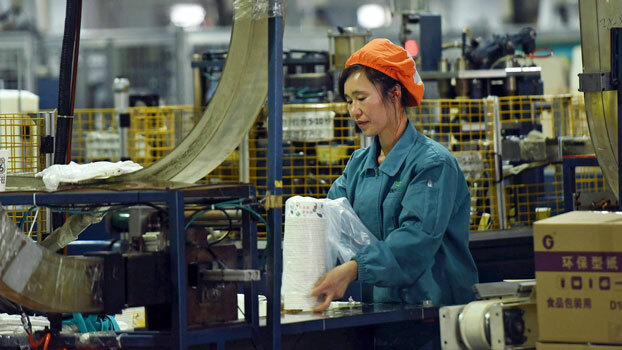 “Fourth-quarter annualized real GDP growth was considerably closer to 2.4 percent than 6.4 percent,” said Derek Scissors, an Asia economist and resident scholar at the American Enterprise Institute in Washington. In postings, Scissors has cited numerous inconsistencies in NBS data, finding major flaws in some categories like per capita income and signs of falsification in others like urban unemployment rates, which remained virtually unchanged for over a decade. “Unemployment is not smoothed; it is rigged outright,” Scissors wrote in a recent paper. Not all economists believe that the official GDP figures for last year are that far off the mark. Gary Hufbauer, a nonresident senior fellow at the Peterson Institute for International Economics (PIIE), estimated that “the true GDP growth rate is in the high five-percent range,” noting that the International Monetary Fund has forecast growth of 6.2 percent this year. Traditional surrogate indicators like power consumption may not give much guidance on the 2018 results because of policy changes. While power use rose 8.5 percent last year, one-fourth of the increase was due to the government’s push to switch winter heating from coal to electricity and natural gas, a China Electricity Council official said. Rail tonnage climbed 9.1 percent last year, state-owned China Railway Corp. said, but reports suggest that part of the gain resulted from new lines to carry more coal. PIIE research analyst Zhiyao Lu pointed to more reliable customs figures showing a 15.8-percent rise in imports last year, suggesting that domestic demand remained strong and that GDP is not “considerably lower” than the NBS claims. But anecdotal evidence cited separately by The Times appears inconsistent with official growth rates. Production at three Ford Motor Co. plants in the central municipality of Chongqing has slowed to a crawl, while hundreds of chemical plants in eastern China’s Jiangsu province have closed and factories in coastal Guangdong province have laid off workers, the paper said. Official industrial output growth slowed to 6.2 percent last year from 6.6 percent in 2017, which officials blamed on a 2.76-percent drop in total auto sales last year in a troubling sign for one of China’s pillar industries. Retail sales of passenger cars slid 5.8 percent, marking the first decrease since 1990, the China Passenger Car Association said. The loss for automakers accounted for two-thirds of the total decline in retail sales growth in 2018, an official of the National Development and Reform Commission (NDRC) said on Jan. 29, according to Xinhua. There are also questions about whether the NBS may have adjusted earlier GDP data to give the 2018 growth rate a boost. On Jan. 18, three days before the 2018 figures were released, the NBS revised the 2017 GDP growth rate downward from 6.9 to 6.8 percent. The adjustment, amounting to 636.7 billion yuan (U.S. $94.8 billion), may have given the 2018 numbers a slight edge. Doubts about China’s official GDP accounting date as far back as 2007, when Premier Li Keqiang called the figures “man-made” and “for reference only,” according to a leaked memo quoting his comments when he served as Communist Party secretary of northern Liaoning province. The NBS has made several attempts since then to reform its data collection and reporting to curb local falsification and provincial exaggeration. A “unified” system to prevent provincial GDP reports from adding up to more than national estimates, first promised for 2016, is supposed to take effect at the end of this year. At a press conference last week, an NBS official insisted that data inflation problems were a thing of the past, Bloomberg News reported. The government is seeking quality growth, rather than fast growth, “and so doesn’t need to artificially inflate the data,” Bloomberg paraphrased the official as saying. But it is unclear whether the NBS reforms will result in a consistent series for past GDP reporting or require more retroactive revisions over time. Cases of data fraud have been reported as recently as Jan. 10, when the NBS vowed to step up punishments for the practice after finding “serious data doctoring” at 118 firms. But beyond issues of accuracy and falsification, a more important question for China’s policy makers has yet to be answered. If the official statistics are known to be unreliable, are they used as the basis for economic policy decisions, or does the government have access to better data when it formulates a response? The answer could be crucial to the timing and amount of support the government decides to give to specific sectors, for example, or whether to loosen lending controls, more than it already has. “Without accurate data, the government will struggle to understand what’s actually going on in the economy, which is critically important as growth slows,” Bloomberg said. Scissors said the question of accuracy is not an issue for the time being, but only because the disparity between official and actual GDP is so large. “They know they’re slowing, because it’s obvious. And they know why (credit allocation), because that’s also obvious,” said Scissors. “They don’t need accurate numbers right now, just better than their own ridiculous headline figures,” he said. But Scissors also suggested that the current downturn may answer the question of whether the government is relying on faulty NBS data for its policy responses. “It certainly does not rely on its public numbers,” he said.